John Stackhouse is a professor of theology and culture at Regent College. Reared in a traditional Plymouth Brethren home, he noticed early on the apparent absence of women in public worship. In the 1970s, as American culture was going through radical social transformation with respect to gender, Stackhouse himself underwent a radical paradigm shift. While embracing an egalitarian position, he realized that the development of a theological basis for his position would require a more open-minded approach. The first chapter begins with Stackhouse's own story and his rationale for a new paradigm with which to evaluate the issue of gender. He felt that no one, complementarian or egalitarian, was able to explain adequately such puzzling texts as 1 Timothy 2:11-15. Stackhouse rejects the use of "proof-texting" as well as appeals to current social practices that are often used in gender debates. Instead, he asserts that theological conclusions should not be put off until all the relevant texts are seamlessly arranged into place, but that Christians should be open-minded as much as possible and find the interpretation that "makes the most sense of the most texts, and especially the important ones" (23). In chapter two, Stackhouse lays out his theory for understanding the issue of gender from a biblical perspective, taking into account the nature of the church, the mission of God in the world, and the way in which the Holy Spirit fulfills that mission. He looks at implications for various spheres of influence: the Christian home, church, and society at large. As Stackhouse surveys the biblical text, he finds a double, not a single, message. Effectively, he sees an affirmation of gender equality that should eventually result in the abolition of patriarchy. However, he also sees a temporary and culturally conditional accommodation to patriarchy, which would be abolished once social conditions had changed. Finally, in chapter three, Stackhouse answers critical challenges to his paradigm from both camps, patriarchalist/complementarian and egalitarian, affirming that the task of theology is to "formulate an interpretation that does the best job, relative to other options, of explaining most of the important data and as much of the remainder as possible" (75). He welcomes the opportunity to "reconsider and reconstruct" his interpretation to reflect best all data presented in the biblical text. The book ends with two appendices, addressing, respectively, the need for hermeneutical methodology when deciding the issue of gender and the increasing need for an orthodox women's (and, yes, feminist) perspective in the study of theology. Having previously read Slaves, Women & Homosexuals by William Webb, I see Finally Feminist as a coherent synthesis and a practical application of the redemptive-movement hermeneutic, whereby our modern culture should be living out the redemptive spirit of the text as read against the backdrop of its original and surrounding culture. Stackhouse openly claims a similarity between his paradigm and Webb's work, but points out where Webb is sometimes unclear and seeks to clarify what it means to discern "the spirit versus the words of the biblical text" (11). Stackhouse argues against the need to distinguish between them when forming an interpretation. Instead, he asserts that the distinction to highlight is the double message seen throughout the biblical text, especially in Paul's writings, with respect to gender and other issues. Stackhouse points out that both egalitarians and patriarchalists find support in Paul's writings precisely because he simultaneously gives the church instruction for survival within the patriarchal culture of the time while promoting the egalitarian dynamic initiated and exhibited in the ministry of Jesus (51). Stackhouse uses key passages from both the Old and New Testaments to illustrate this pattern of "doubleness." For example, in Leviticus 12:1-5, giving birth leaves a mother ceremonially unclean twice as long with a daughter as with a son. The patriarchal implication is clear. However, in Leviticus 12:6-7, once purification has been completed, the required sacrifice for the dedication of the child is identical whether the child is male or female. So, while there is a customary privilege given to the male, there is simultaneously a surprising affirmation of both male and female as equal (65). Likewise, in 1 Corinthians 11:7-10, he feels Paul presents an interpretation of woman that contradicts Genesis 1:26-27, where both male and female are made in the image of God. However, in verses 11-12, Paul continues with a statement that affirms equality and lays the groundwork for egalitarianism (68). 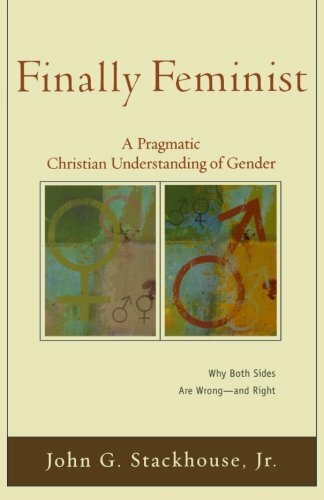 This insightful and balanced perspective on gender has the potential to initiate a real and loving dialogue among complementarians/patriarchalists and egalitarians instead of heated, and essentially nonproductive, debate. By acknowledging the intrinsic references to patriarchal cultural values embedded in the biblical text, we should not only appreciate the loving way in which our Lord works with our human limitations and chooses to move humanity gently toward his ideal and ultimate ethic (Isa. 40:3-4), but we should also learn from his example as we discuss and debate this issue with similar love and grace.